At last I have the floorboards looking as I wanted, well they say third time lucky don't they? I made them the same as the others but this time gave them two coats of clear satin varnish. No elbow grease needed and a lovely not too glossy sheen. 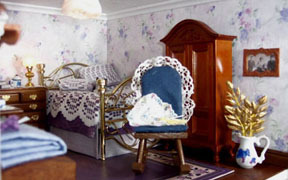 This room is 31cm deep, 28cm wide and 19cm high. 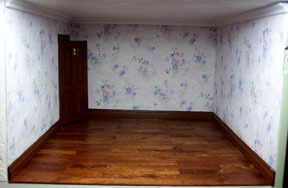 I have decorated it with another of my real wallpapers with skirting and coving the same as before. t shirt transfer paper and a printie. It's ironed onto binca then glued to a piece of card. I like the effect. 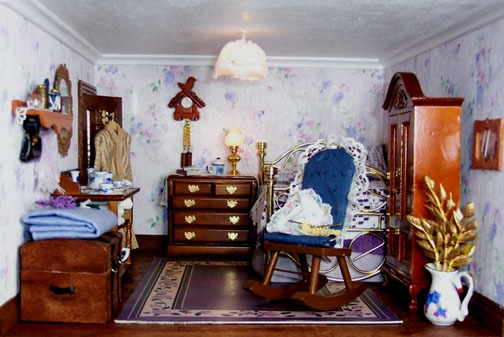 I had difficulty furnishing this room until I thought to push the bed into the corner. I picked up the chair at a junk shop for a few pence, it had big ugly arms and a strange pixie sitting in it. I removed said arms and pixie and replaced them with cushions. When the front is put onto the house the chair is positioned so that Amelia can nosy out of the window at the neighbours while she sits and knits. The gold leaves in the big jug are probably wrong for this room but they do brighten it up. 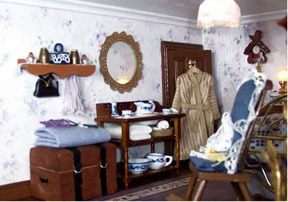 This is the left side view of the room, the dressing gown behind the door is the same as the one in the small bedroom, it's just different fabric. I'm pleased with the mirror which is a small handbag one framed with some painted plastic lace. On this right hand view you can see a picture of my great grandparents, I made the frame with bits of lolly sticks and plastic lace pieces. 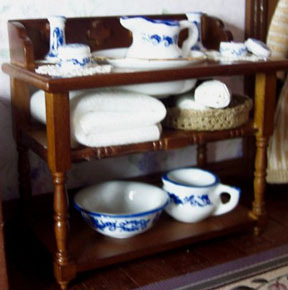 This washstand was a bargain buy from ebay, I have dressed it with plastic lace doilies tissue paper towels and blue and white china. The basket is tapestry canvas the same as before. 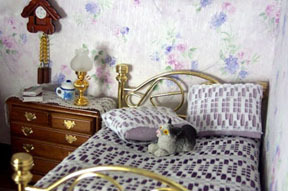 Here is a close up of the bed, I dressed it with fabric remnants and used a piece of net curtain for the lace bedspread and pillow shams.Fiddle the cat is very comfortable here. 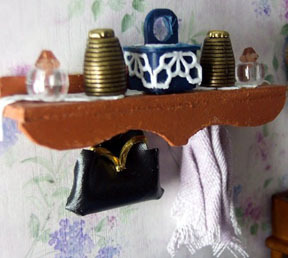 The little shelf is made from wood offcuts, the blue box is a container lid, the gold pots are toggles from an old raincoat and the little jars are beads. I tried to make an old fashioned handbag with some thin plastic and a curtain ring, it isn't quite how I imagined it. 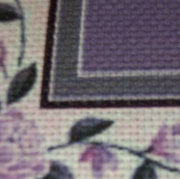 The shawl is a scrap of fabric frayed. 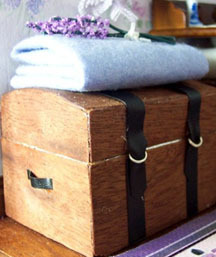 Here is another use for the teak wood veneer I used for the floorboards, this time it's covering a shaped cardboard box I bought at a craft shop. I used more plastic strips and jewellery findings to make the straps. The cosy blanket is a piece of felt fabric with my first attempt at making flowers on top, hmm need more practice at these.